In 1993, while doing construction work on the north side of the site of Sepphoris, workmen discovered the remains of a synagogue that dates to the fifth century AD. Although the walls of the synagogue had been destroyed, its mosaic floor was quite well preserved. 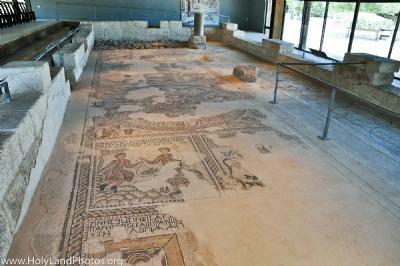 The main part of this floor consists of seven panels that include scenes from the life of Abraham and Sarah, a Zodiac(! ), representations from the temple, the life of Aaron, and objects associated with the synagogue. The descriptive comments that accompany the images are based in part on the articles of Weiss and Roussin listed below. Roussin, Lucille A. “Helios in the Synagogue—Did Some Ancient Jews Worship the Sun God?" Biblical Archaeology Review vol. 27, no. 2 (2001): 52–56. Weiss, Zeev. “The Sepphoris Synagogue Mosaic: Abraham, the Temple and the Sun God—They're All in There.” Biblical Archaeology Review vol. 26, no. 5 (2000): 48–61, 70.